The recent legalization of marijuana has kicked off a firestorm of political debates. Is marijuana a harmless diversion or a gateway drug to harder, more dangerous substances? Should it be legal for medicinal purposes? Where does individual choice end and government oversight begin? How do you weigh the one person’s freedom to live their life as they want against the good of society? 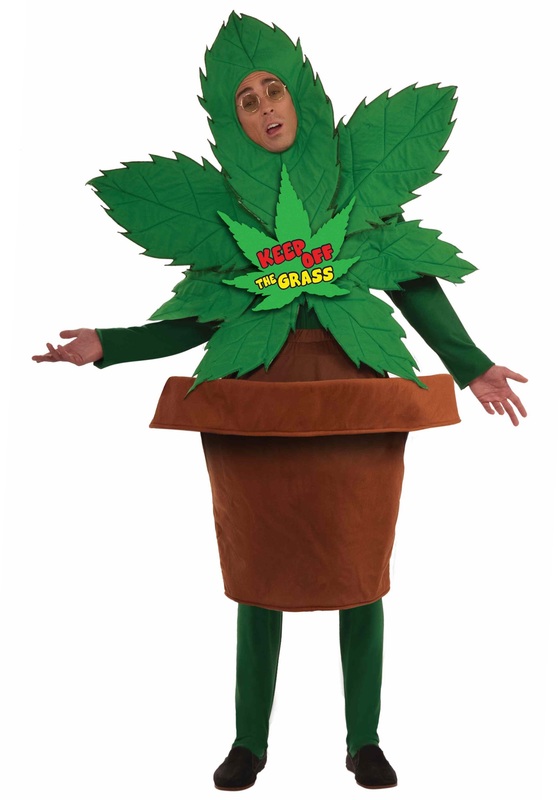 If you want all the fun of marijuana but none of those annoying side effects, why not try out our Keep off the Grass costume? You’ll definitely be the life of the party when you show up looking like everyone’s favorite five-leafed plant. The costume comes with a green leaf top that fastens with Velcro straps and a brown flower pot bottom with an elastic waistband for a comfy fit—plus a sign proclaiming, “Keep Off The Grass,” in case someone doesn’t quite get the joke. … Alternatively, the costume can also be used as a clever protest against marijuana, if that’s how you roll (or rather, don’t roll). It’s all there in the sign: Keep Off The Grass. This costume has received very high ratings from our focus groups…. Very high indeed.